1.Flat: No composite high temperature creasing on the surface, no residual stress on the surface, no deformation after shear. 2.Decoration: Painted with wood or stone lines, prepainted aluminum coil has distinct physical texture with fresh natural aesthetic feeling. The pattern can be designed freely, which gives customers a wide range of individual choice, can enrich humanities connotation of products, give people more beauty to enjoy. 3. 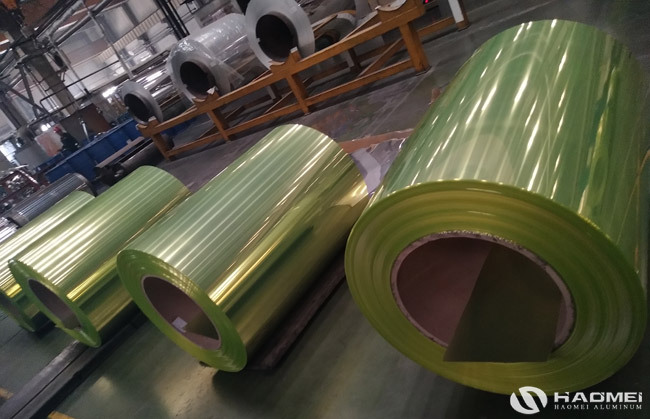 Weather resistance: After coating, high temperature baking of the aluminum coil to form the lacquer pattern, with high gloss retentivity, color stability, little color difference changes. Quality assurance of polyester paint is about 10 years, fluorocarbon lacquer for more than 20 years. 4. Machinery: Selects high quality aluminum, plastic and adhesive for materials, use advanced composite technology. Product is with bending, flexural strength needed for decorating plate, under the condition of four seasons climate, with the change of wind pressure, temperature, humidity and other factors, it does not cause bending or deformation, expansion, etc. 5. Environmental protection: Resistance to salt corrosion of acid rain, itself won’t corrosion or toadstool, won’t release any poisonous gas, won’t cause rust of keel or fixed, also with flame retardancy. Haomei aluminum coil are willing to offer professional prepainted aluminum coil with different colors and gauges to fulfill your demands, our product are all with high quality and long durability. And our expert stuff will support you in selecting the right paint system for your industrial application, if you have any question on our products or company, you can get in touch with us via the contact details available on our Website.